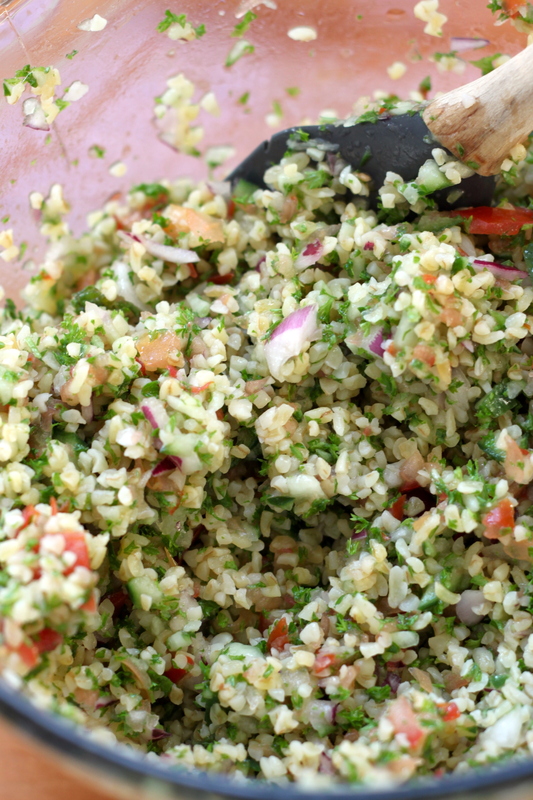 Tabbouleh has to be one of my favorite dishes to make any time of year. The best part of any tabbouleh recipe is that you can adjust the ratios of each ingredient to get it just the way you want it. 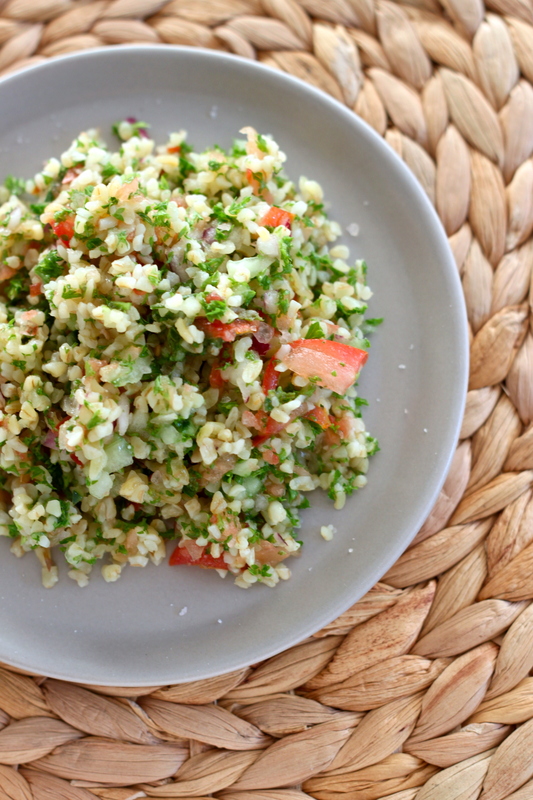 If you want more parsley than bulgur or more cucumber than tomato you can easily adjust and the finished product is still amazing. One of the benefits of being born and raised in Los Angeles is that you have the opportunity to be exposed to many different cultures and their cuisines and one of my favorites is Middle Eastern food. I’ve had the great honor of having people in my life who are from places like Armenia, Iran and Jordan and who have been kind enough to share with me their traditions, culture and their food! Quick aside, as I type this, it’s Cinco de Mayo in the States and I’m getting texted photos of all of my family and friends Cinco parties – the food and the drinks and it’s totally killing me. I haven’t had so much as salsa, a margarita or a tortilla since the move to New Zealand in August of 2016. It’s practically torture. I digress. Pulling myself together. Sorry. Anyway, in my last role, we would order in lunch from this amazing Mediterranean place. 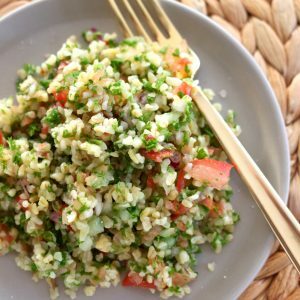 Big plates of saffron rice and lamb kabobs would arrive but the star of the show was the lemony tabbouleh that would accompany it. Fresh and clean and so incredibly good for you. 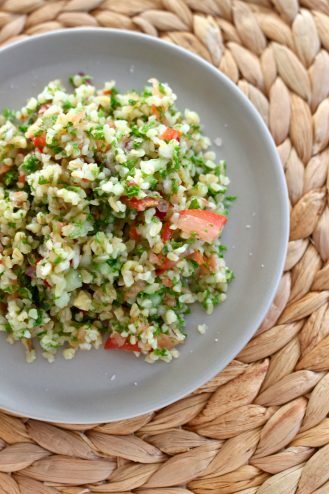 I served this salad at the BBQ after my wedding day and it was a total crowd pleaser. 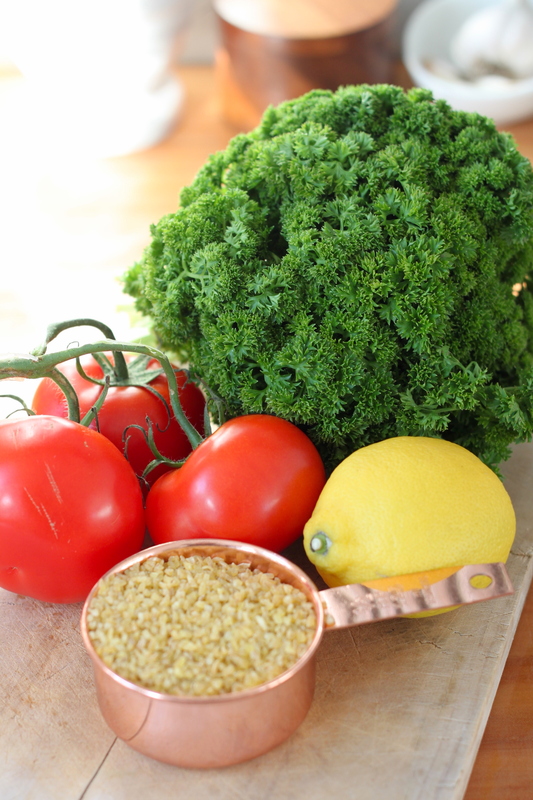 Begin by boiling at least 5 cups of water followed by rinsing the bulgur wheat. Place wheat in a heat proof bowl and pour in the boiled water. Let sit for 15 - 20 minutes or until just soft. For the other ingredients, it’s easiest to use a food processor but chopping by hand is also fine. Begin by placing garlic clove in food processor and pulse until coarsely chopped. Next, pulse onion and scrape mixture into a large bowl. 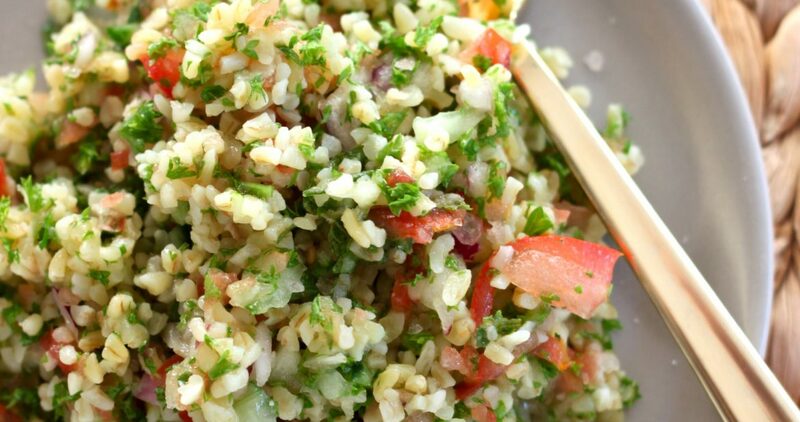 Pulse the parsley, tomato, cucumber and mint separately until just finely chopped, scraping each into the bowl. Drain the bulgur wheat in a fine meshed sieve and pour into large bowl with other ingredients. 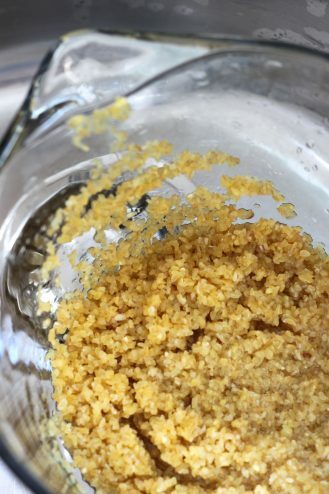 Pour in lemon juice and olive oil and mix until well combined. Refrigerate for at least 30 minutes, stirring every 10 minutes or so. Before serving, let sit out for 15 minutes and salt to taste.